Who could resist a game with the title, Eight-Minute Empire? 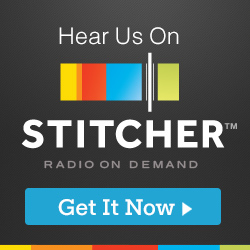 It’s intriguing to me on a number of levels. First, who would dare put — what appears to be — the apparent playing time on the cover of their game box, as part of the title no less? Is the title a dare? Is it a challenge? Is it a taunt? And then there’s the word “Empire.” An empire isn’t just a country, it’s a vast group of states and peoples under a central authority. An empire implies incredible depth, expensiveness and complexity. Pairing that with “8-Minutes” is surely an oxymoron. Surely Eight-Minute Empire is a title to pique one’s interest. The double-sided board of Eight-Minute Empire is small for an empire and depicts fictional continents comprised of territories and separated by water. There are dotted lines on the board to indicate where you can cross from one continent to another. Everyone begins the game with a small collection of wooden cubes in a single territory. Think of this stage as the dawn of civilization. From this point you begin spreading your people, your armies — AKA, your little wooden cubes — across the board. The more territories you control, the more continents you control, the better. A large part of Eight-Minute Empire is about the distribution of your armies over the course of the game. There are no dice, and there are no battles per se. Simply, if you have more cubes in a territory than your opponent at game’s end, it belongs to you and is worth a victory point. If you control more territories within a continent than the other players, this is also worth a point. Now here comes the cool part. On your turn you choose one of six randomly drawn, face-up cards lined up along the edge of the board. Each depicts an action for your turn: Moving armies over land or sea, placing armies, building a city (which is where you can place armies) or destroying an opponent’s army. The action cards are progressively more expensive in the line, with the first card being free and the last costing three coins. In case it wasn’t obvious, you begin the game with a set number of coins to spend on these cards, based on the number of players. 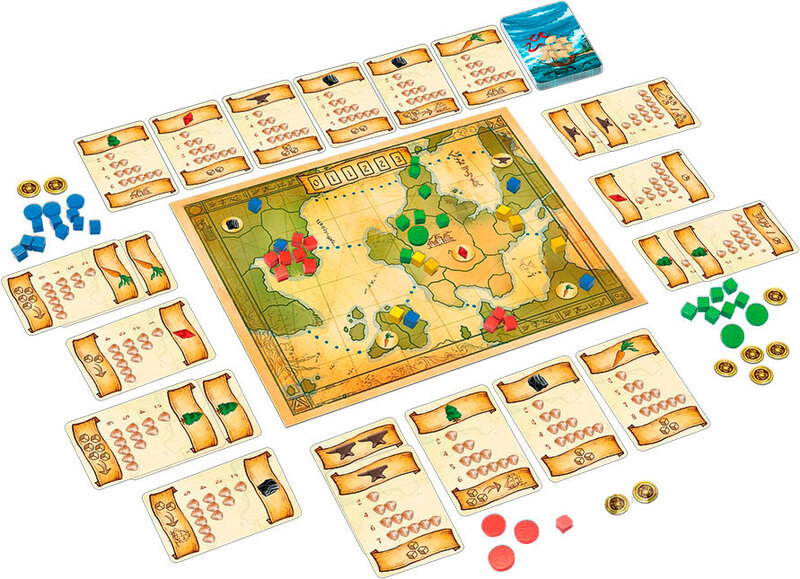 The game length is also set by the number of players, from as many as 13 turns for a two-player match, to as few as 7 turns for a 5-player game. Finally, it’s not just actions depicted on these cards. There is a mini set-collection game going on in addition to the struggle to expand and conquer the game board. 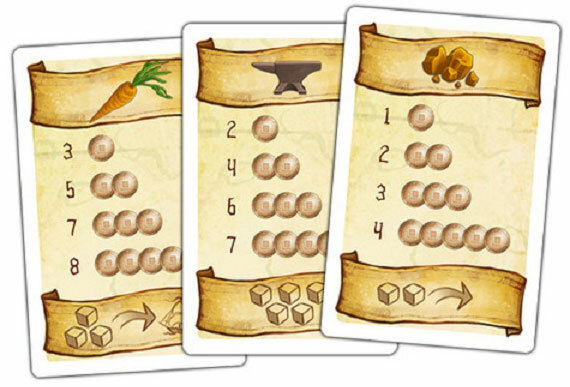 On each card you’ll also find one of several symbols, such as an anvil, a tree, or a gem. Collect a bunch of cards of the same symbol and you’ll get some bonus points. Eight-Minute Empire is nicely balanced in that you can’t ignore the set collection element, but if you make it your primary focus, you’ll surely suffer on your empire-building. You need to strike the perfect balance to pull out a victory. There is a lot of strategic decision-making to be done when it’s time to select your action card. You are always assessing the cost of the card with it’s action, it’s symbol and even the card’s desirability to others around the table. With a finite number of turns in the game, choosing the perfect card can be a difficult choice. The ideal card may cost you three coins, but you’re running short on cash. Do you take the risk? Maybe you take the free card this turn and hope the card you really want shifts down the line into a less expensive slot as the players take their turns. As far as victory points go, the games were generally quite close. In fact, they were so close at times that the final turns were often critical in determining the winner. This isn’t a game where you’ll find one person running away with the win and leaving everyone else in the dust. You’ll more often than not at least feel like you’re in contention all the way to the finish line. 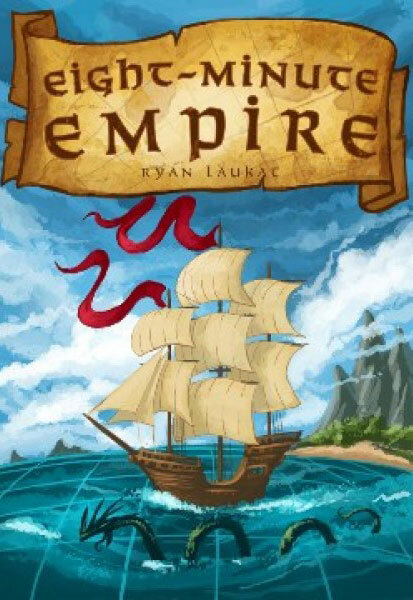 That’s Eight-Minute Empire, published by Red Raven and designed by Ryan Laukat, who also handled the beautiful artwork in the game. I definitely recommend Eight-Minute Empire, which you can play in 30-40 minutes. I still love the name. Perhaps eight-minutes is the length of time it takes to read the rules. Which if fine by me.